Jump-start your life. Seize the opportunity to work for one of the top companies in the world's greatest industry – travel! 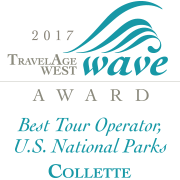 Collette, a world wide leader in guided travel, is pleased to be recognized as one of Rhode Island’s Top 10 Best Places to Work by the Providence Business News for the past nine years! Collette received this honour after our employees were surveyed about their work atmosphere, employee benefits and a genuine sense of community involvement in the office. Do you believe that travel is vital to a life well-lived? Do you dream about the world’s greatest treasures and actually seeing them someday? Do you envision yourself as part of a team that creates memories and experiences to last a life time? If you answered “yes” to the above questions, we encourage you to browse our job openings. Collette is constantly growing and we’re looking for employees to fill roles in travel that incorporate guest relations, customer care, marketing, IT, product development, and much more. With an employee retention rate of 10+ years, it is clear that the happiness of our employees is directly related to the positive morale evidenced among our 500+ employees world wide. Working for Collette is a chance to be involved with a long-standing, family-run organization that is dedicated to fulfilling dreams and experiences for others. Employees benefit from tuition reimbursement, an on-site gym for the Rhode Island office (with personal trainers and classes to keep you well-balanced), the opportunity to donate your time to community organizations (while getting paid! ), and countless chances to see the world up-close and personal! Don’t worry, you’ll also get all the good stuff like health insurance, dental, 401k profit sharing, company outings, surprises and generous paid time off!